Timelines are an awesome tool to teach students about eras in history and how one event might impact subsequent events. In my US History classes, I use them often. Usually each unit, we will look at some for of timeline to get a look at everything students need to know. When I teach about the Civil Rights Movement, I use this set of timeline activities. I love this one because it provides a few different options to use. 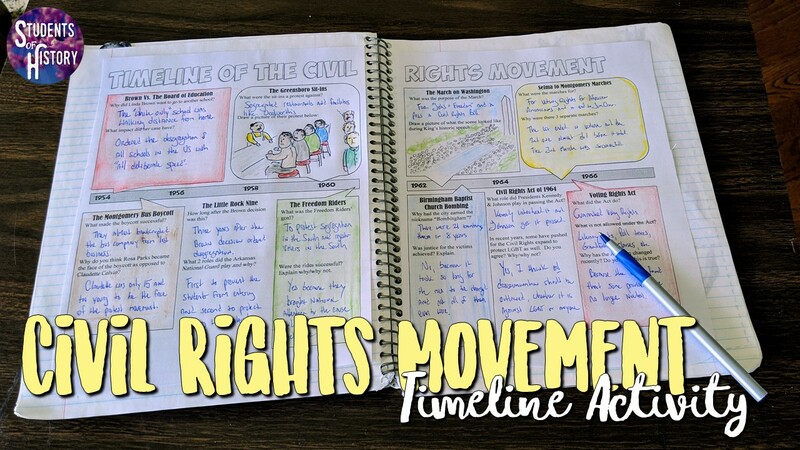 It's also great to use at the start of the unit as an introduction to all the main events of the Civil Rights Movement or at the end of the unit as a review. I have used it both ways and it has been great! Either way we use, I post 10 readings up around the room as stations. These are 10 of he most significant moments of the Civil Rights Movement. It's not all of them (for example, I also always include Emmett Till, Loving v. Virginia, the assassination of MLK, Ruby Bridges, and a few other significant events in my lessons), but I also don't want to overwhelm students. So, I think 10 events on a timeline is a good amount to be thorough, but not too much. Each event is covered with a 1-page reading and photographs at the stations. Students each receive a 2-page timeline that goes into their interactive notebooks. These are the "centerfold spread" style that are great for covering a lot of info in an organized way. 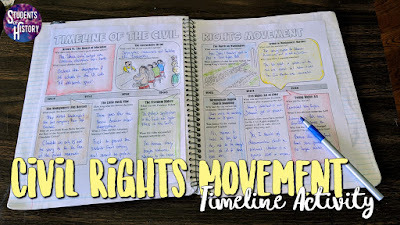 The timeline has students respond to prompts, draw pictures, analyze the events, and connect to today. Each station can be completed in a couple minutes so that the entire timeline can be finished in class. Absent students can complete the entire activity also through an included Google Doc version! This editable set includes the same readings and a table students can type into. Or they can complete a "drag-and-drop" Google version in which students sort the events. These versions are also great for differentiation if you have students that need more accommodations or even if you just need to make a few changes. This is an AWESOME lesson plan resource for your middle school classroom! You can download this resource for your classes here or as part of my larger Complete Civil Rights Movement Unit Bundle. If you want more great lesson plans and resources for ALL of US History, you might want to sign up for a Students of History subscription! Joining gives you immediate access to HUNDREDS of amazing resources and lesson plans for every day of the school year! You'll never stress about a lesson plan again! !